Win one of these cool prizes! 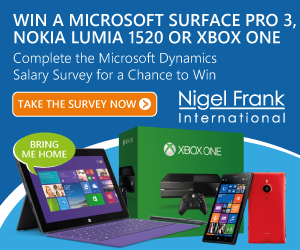 Take part in Nigel Frank’s industry acclaimed annual Microsoft Dynamics Salary Survey and find out latest Dynamics compensation trends. You will automatically be entered into a prize draw to win a Microsoft Surface Pro 3, a Nokia Lumia 1520 or an Xbox One. Once the Salary Survey report has been compiled, you'll be one of the first to receive it via email. The results of the survey give an unparalleled insight into global salary trends for Dynamics professionals. It will allow you to benchmark your team’s, company’s and your own salary against your peers.